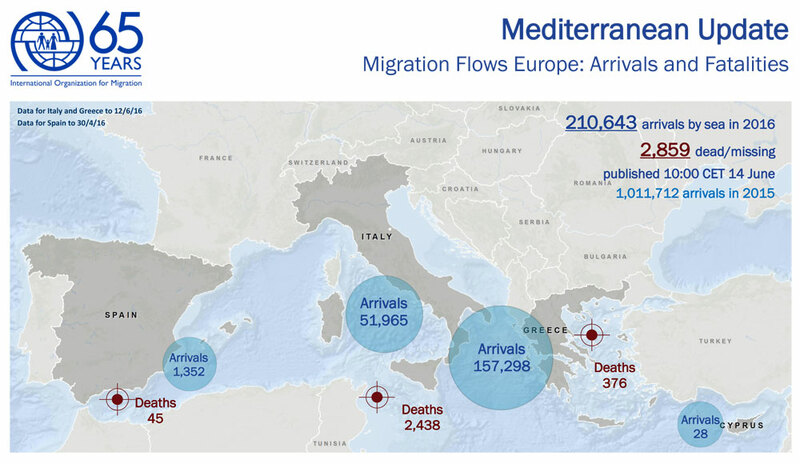 Italy - IOM reports an estimated 210,643 migrants and refugees entered Europe by sea in 2016 through 12 June, arriving in Italy, Greece, Cyprus and Spain. Deaths so far this year are 2,859 compared with 1,838 through the first six months of 2015. In other words, fatalities on the Mediterranean Sea in 2016 stand at 1,020 ahead of last year’s mid-year total, although we remain three weeks shy of 2016’s mid-year point. IOM’s Rome spokesman Flavio Di Giacomo reported Monday that over 3,180 migrants have been rescued at sea and brought to land since IOM’s Friday (10 June) report. He added that the majority of migrants likely sailed from Libya. Other rescue operations were carried out Sunday, whose rescued migrants were to land in Italy Monday and today. IOM estimates 51,965 migrants have arrived in Italy so far this year. Egyptian migrants are increasing their arrivals to both Italy and Greece, IOM reports. Between January and May 2016, a total of 1,815 Egyptian irregular migrants landed on the Italian shores including 1,147 (78 percent) unaccompanied migrant children (UMCs), ranking Egypt as the tenth top “sender” country of irregular migrants to that country and the top sending of unaccompanied migrant children. In 2015, numbers of Egyptian irregular migrants arriving in Greece almost reached 1000. IOM Egypt assists irregular migrants who wish to return to their home country voluntarily. Since 2012, IOM has provided voluntary return and reintegration assistance to 1,269 Egyptians returning mainly from Germany, Greece, and The Netherlands. Italy and Egypt have a readmission agreement, which does not require IOM’s engagement for voluntary returns. However, as a result of the increasing numbers of Egyptians arriving, Italy now is providing a seven-day permit, and expects migrants to return to their homelands on their own.